Economics of religion, economic history, economic development, labor markets in LDCs (less developed countries). 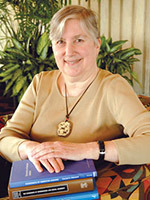 Professor Carmel Chiswick is a Development Economist and a Labor Economist. She holds a Ph.D. from Columbia University in the City of New York, where she studied economic development and economic history. She worked as an Economist at USAID, the United Nations, and The World Bank. She frequently presents her research to academic conferences and community groups and has held several visiting appointments at universities in the U.S. and in Israel. She is currently Professor Emerita from the University of Illinois at Chicago and Research Fellow at the Institute for the Study of Labor (IZA) in Bonn, Germany. Professor Chiswick joined The GWU Department of Economics as Research Professor in 2011.